The Burgman is still going strong. Its strongest points continue to be its spacious seating and multiple storage areas, ride quality and the overall build quality. I would like to talk about the build quality for a moment because I recently had a small fall on the Burgman. I was nudged from behind by a hatchback, while I was traveling at around 30km/h. It was raining, and the road was wet. My rear wheel spun, and the bike fell much harder than I did. When I brushed myself off and walked back to pick up the bike, I was surprised to see that there was no real damage done, besides a bit of paint being scratched off. You can tell just by looking at the Burgman that it has high quality components, but I was impressed to see that everything was almost untouched after the accident. 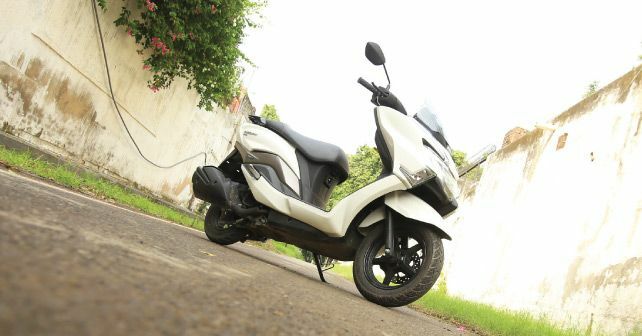 Apart from its nice build quality, the bike feels premium when you’re riding it, and that’s because the ride quality, seating space, light handling and peppy and refined engine all come together to offer you a great riding experience. It doesn’t matter if you are running errands, or just commuting to the office on a daily basis, the Burgman always makes you feel comfortable and relaxed.